I resolve to make more desserts. Desserts terrify me. They cook in the concealment of the oven; I can't watch them. The line between underdone and burned is a split second. Exact measurements (instead of eyeballing it) are needed. The results can be influenced by the weather. If it's raining you might have to add more flour; or if there's too much humidity in the kitchen! What they hay?? Chemistry is involved! There's just too much that can go wrong. Plus, we never had them growing up. As my dad says, "I'm a salt and grease man." We just didn't have them in the house. My husband eats desserts after every meal. And sometimes before. And often in between. His family excels at making them. There's always a pie, a cake, cookies, or sweet bread lying on the counter. If not, there's backup candy in the cupboard. I don't know how he maintains such a slim athletic physique, but he can handle them (I, meanwhile, am still working off the piece of coconut cream pie I consumed the Christmas of '07). With fear and trembling, then, in the interest of self-sacrificial love (of course), I resolve to bake at least once a week for my husband. Tonight I'm making choco-mallow bars. The timing of my unnerving unresolution is perfect. Lent starts in two weeks. 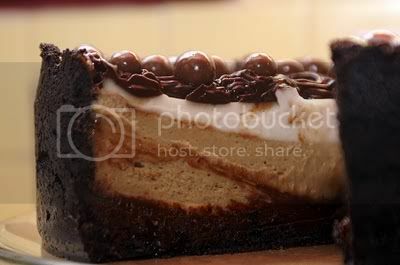 That dessert (cappuccino fudge cheesecake) was particularly delicious :). But my choco-mallow bars last night were pretty disgusting. They tasted like moon pie cake. Agh! If I send them out to the farm, they'll probably be snarfed up even though they're sub-par, but I'm not even tempted by them (which is a good thing, I think). I do have a kitchen scale, but not a single recipe gives the measurements! I was so excited to get it, and it helps with bread for sure but not so much with desserts. Now I'll have to go request the Farmstead Egg Cookbook from my library :-D. Chocolate angel food cake sounds very promising. Thank you!